Find the latest research report of Global Antimicrobial Coating Market which gives huge prospects for the antimicrobial coating industry. This report is beneficiary for those who are looking to invest in antimicrobial coating industry. 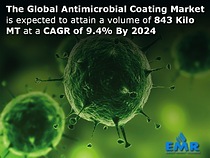 According to a new report by EMR titled, ‘Global Antimicrobial Coating Market Report and Forecast 2019-2024’, the global antimicrobial coating market is expected to see a robust growth with a CAGR of 9.4% in the period between 2019-2024 and is projected to attain a volume of 843 kilo million tons. In 2015, the demand for antimicrobial coating was the highest in North America. The region, especially the US, continues to be a major driver of the global antimicrobial coating market because of favourable government policies along with the increasing demand for antimicrobial coatings for medical and indoor air/HVAC applications. It is proving particularly popular in the healthcare and food processing sectors which require sterile surroundings as it prevents pathogen growth. In the last few years, governments globally are attempting to combat hospital acquired infections, introducing strict regulations promoting the use of antimicrobial coatings to prevent infections. The antimicrobial coating market is especially thriving in North America and Europe due to such government regulations and an increased awareness of antimicrobial coatings in the medical and healthcare sector. Thus, antimicrobial coatings are used in the production of catheters, medical devices and electronics, among other products in the healthcare industry. The growth of the global antimicrobial market is aided by the increasing concerns about the air quality in countries like USA, China and India driving the demand for indoor air purifying products. China and India, especially, are the emerging markets for antimicrobial coatings in their application in the indoor air quality sector due to growing health concerns about the rising air pollution. * Silver, copper, zinc and chlorine coatings are the major antimicrobial coating examined by the EMR report. * Antimicrobial coating can be either a powder coating or a surface modification coating. * Indoor air/HVAC, mold remediation in construction, medical/healthcare, and food and beverages are the major application sectors for antimicrobial coating. * Region-wise the antimicrobial coating market is divided into North America, Europe, Asia Pacific, and the rest of the world. * Healthcare and food processing sectors are the major application segments where antimicrobial coatings find their most use. * The antimicrobial coatings market has been driven by their increased demand in the medical and healthcare sector where they are used as the coating on the devices implanted in the patients’ bodies and other surgical devices. * Growing demand for indoor air purifying systems as well as HVAC systems are providing a growing impetus to the market. * Due to their non-toxicity, bio-compatibility and bio-stability, antimicrobial coatings are in high demand. * Silver based antimicrobial coatings are one of the most rapidly growing antimicrobial coating types due to the toxicity of silver to various pathogens. 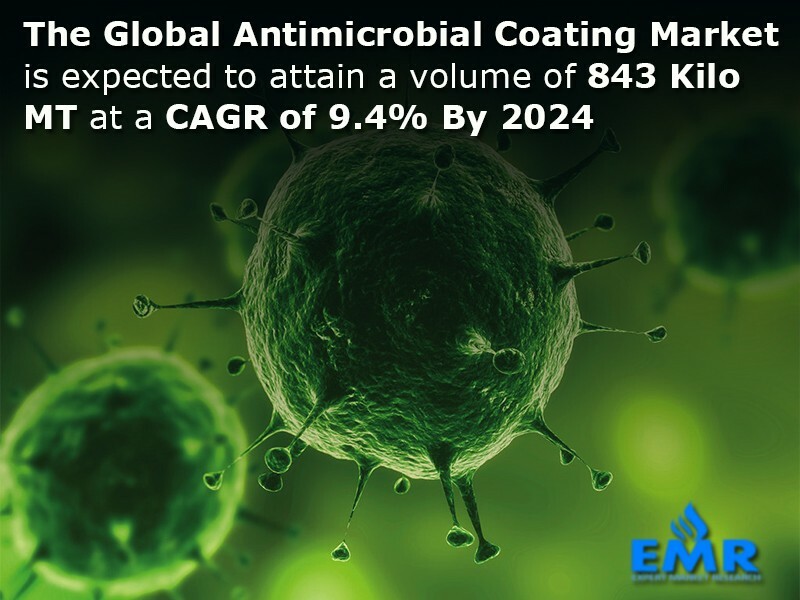 * The report by EMR gives in-depth region-wise insights into the historical (2014-2018) and forecasted (2019-2024) demand for antimicrobial coating by its types, products and applications. * It also analyses the price trends of the different types and applications of antimicrobial coating in the periods 2014-2018 and 2019-2024. Akzo Nobel NV, BASF SE, Diamond Vogel, Sherwin Williams Company, DOW Chemical Company, Axalta Coating Systems Limited, Nippon Paint Company Limited, and DSM NV are the major players in the global antimicrobial market that have been analyzed by EMR. The EMR report provides a detailed insight into the latest developments in the competitive landscape of the global antimicrobial coating market including plant turnarounds, expansions of capacity, and mergers and acquisitions.